In the summer of 1937 a nine-month-old girl was hidden, with her hands tied, in a blackberry bush in southern England. She was found by sheer chance by a family of holidaymakers. Now 80, Anthea Ring has spent most of her life wondering why she was left to die and who her parents were. Thanks to a leap forward in genetic genealogy she finally has some answers. Jane Dodd was tired. The 11-year-old was walking over the South Downs with her family on a bright August day. Ahead were her parents Arthur and Margaret and her older sister Elizabeth. Every year they travelled from south London for a fortnight’s holiday in Worthing. Her father would insist on an invigorating walk in the afternoons. It was still hot, even at 6pm. There was no shade up here, just grassland, gorse and blackberry bushes. Suddenly her mother stopped. “There’s a baby up here,” she said. “Of course there isn’t, there’s no-one up here,” he said. “I haven’t had five children and not know what a baby sounds like,” her mother replied. The family started searching through the scrubland. Minutes later they found a blonde child hidden deep in a blackberry bush. She was wearing a pink dress and looked about one year old. She had scratches and insect bites. Her hands were tied tightly in front of her. Nine years later, Anthea Ring was playing with her friend, Peter, on the road outside her Surrey home. But an argument began and she threatened to go and complain to her mother. “She’s not your mother, you’re adopted,” he replied. Shocked, Anthea ran home and that evening her parents sat her down for a talk. “They told me I was left on the doorstep of Worthing Hospital when I was a newborn baby,” Anthea says. Anthea was very excited by the news. Adopted children were usually the heroines in books she devoured about Swiss chalet schools. “I remember thinking I could tell my friends at school the next day,” she says. She was doted on by her parents, sleeping in a warm back bedroom in winter and a cool front bedroom in summer. Her adoptive father, Douglas Shannan, worked for the Ministry of Food and Anthea remembers going on trips with him to inspect egg-grading stations. “He was a very kind man, I loved going out with him,” she says. She describes her mother Margaret as warm and friendly but quite nervous due to the loss of her first daughter. Margaret was intelligent but hadn’t been able to follow her sister to Girton College, Cambridge, as the family couldn’t afford it. Margaret wanted Anthea to train as a teacher but she wanted to get a job at the first opportunity. At 15 she went to work for the Bourne and Hollingsworth department store in Oxford Street. A few years later she trained to be a nurse in Bath, where she met her future husband Francis. Two children, Jonathan and Christine, followed. One day in 1961, Anthea took baby pictures of Christine over to her parents’ house. They said she was the spitting image of Anthea as a baby. “Then my father said to my mother, ‘You’ll have to show her now Peggy,’ and she went upstairs,” Anthea recalls. Margaret returned with a newspaper clipping, with a picture of a baby. Anthea asked who it was. “It’s you,” her mother replied. Anthea learned she had been discovered by Arthur Dodd on a hillside near Worthing on 26 August 1937. Scotland Yard had launched an attempted murder investigation and made a nationwide appeal for information, but never discovered how she came to be there or who her parents were. Margaret wrote to the hospital offering her a home, after reading about her case in the newspaper. 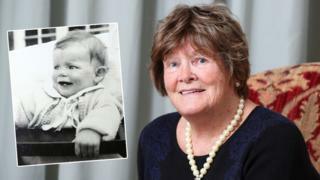 Several other people offered to take Anthea, including a Belgian diplomat, but the Shannans were chosen because they had experience raising a child – Veronica, who had been knocked over by a car when she was seven. “My mother said that when they walked in to the ward I came to the end of the cot and put my arms out,” Anthea says. After receiving this shocking news, Anthea went home and cried. She told her husband but they decided not to tell their children and she put it to the back of her mind. Decades passed, and Anthea’s children had children of their own. Her grandson, Aaron, was also a spitting image of Anthea as a baby and it made her wonder once again who she was. In 1994 she joined a group called Norcap, which helped adopted adults find out more about their past. A member of the group suggested she write to the police in Worthing to see if they had any records. And even though 57 years had passed, the Police Superintendent for West Sussex was able to put her in touch with a retired policeman who had worked the case. He was known as Mac. “He told me he’d been on crowd control in Worthing that day as they’d had a famous film star at the cinema. He got called back after I was found and was put on door-to-door enquiries,” Anthea says. Mac was convinced Anthea was not a local child, as it would have been impossible to keep such a secret in a small community. He thought she could have been brought on the train from London. Their meeting was reported in the local paper, after Mac told the local retired policeman’s association about it. The wider press got wind of the story and Anthea was once again the focus of national news. Weeks later she received a letter simply addressed to Anthea, with the name of a local TV show she had featured on. It was from Elizabeth Dodd – the eldest daughter of the family who had found her on the Downs. “She said I’d ruined her holiday all those years ago because she had wanted her parents to adopt me and they wouldn’t,” Anthea says. Elizabeth told her the family had been returning from a walk when her mother had heard her cries. They had taken her to the nearest house but it didn’t have a phone so they carried her on to the big farmhouse in the village of Sompting. Elizabeth has since died, but her younger sister Jane, now 92, still remembers that day. She says the family was walking along the side of Cissbury Ring when her mother heard Anthea’s cries. She remembers that her parents called the hospital the next day and were told the baby had been called Ann. Anthea also received a letter from Betty, a nurse who had looked after her at Worthing Hospital. “Apparently I was put in a cot in the sister’s office. Betty realised I needed a name when she handed over at the end of her shift. She called me Ann, as it was her favourite name,” Anthea says. Anthea stayed at Worthing Hospital for six months while the police investigated. Her only injuries were to the skin of her wrists, where she had been bound. “Apparently the ward sister used to take me out in a pram and walk up and down the front. I’ve always loved the sound of seagulls,” Anthea says. Although Anthea now knew far more about how she was found and cared for, she was no closer to finding her parents. Her only clue was Mac’s hunch that she had come from London. There were no further breakthroughs until 2012, when Anthea, then 75, decided to take a DNA test. This revealed her ethnicity was 92% Irish and matched her with some distant cousins in America and Ireland. One cousin called Joan, living in North Carolina, asked relatives in her extended family tree to take tests. This revealed Joan was linked to Anthea through her father’s maternal side. They came from County Mayo in Ireland. “I met Joan in 2013. She was the first blood relative I had ever met so it was quite something,” Anthea says. Two years later she matched with a woman who worked at Dublin University, called Ann. Ann didn’t match with Joan, which suggested she was from the other side of Anthea’s family. Ann’s family came from County Galway. By this time Anthea had joined online communities for adoptees and foundlings and in April 2016 she was contacted by genetic genealogist Julia Bell, who offered to help. Bell had managed to track down her own American GI grandfather using DNA and genealogical research. She had then started helping other people look for their relatives in her spare time. Anthea and Bell met at Paddington Station, where Anthea told her everything she had found out up to that point. Bell encouraged Anthea to take some further DNA tests with different companies, knowing that millions more people had joined DNA databases since Anthea tested in 2012. This provided further distant cousin matches. “We then used genealogy to build trees to find possible common ancestors and then brought the lines down,” Bell says. After months of work with the help of genealogist Angie Bush, Bell had narrowed down the search. She was confident one parent was a Coyne from County Galway and the other was an O’Donnell from County Mayo. She was considering the seven daughters of a John O’Donnell when things began to fall into place. “I was looking at the youngest daughter, Ellen O’Donnell, who was born in 1911,” she says. Irish amateur historian Catherine Corless had told Bell that Ellen’s official name would be a Saint’s name – and baptismal records revealed this was Helena. Then came the eureka moment. “Earlier on I had ordered records of illegitimate births in England and Ireland in 1936. I had come across an unmarried mother called Lena O’Donnell but dismissed it. Corless found out Lena O’Donnell had got married in Ireland in 1945, seven years after Anthea had been found, and had given birth to four more children. She tracked down one of the sons who agreed to have a DNA test. In April 2017 the test confirmed Bell’s hunch. He was Anthea’s half-brother. “I was sitting in the garden in the sun when Julia rang,” Anthea says. Anthea’s birth certificate revealed she was born on 20 November 1936, just five days after the date her parents picked for her birthday. Her birth name was Mary Veronica. Lena had been moving between digs in Cricklewood when Anthea was born at St Mary Abbots Hospital in Kensington. She gave her occupation as a machine operator at a telephone factory. She was taken in by a charity for unmarried mothers called the Home for Guardian Angels after leaving hospital on 7 December. However, she didn’t stay long. A baptismal record from 18 December reveals Lena moved with her baby to another home called Devon Nook in Chiswick. This Roman Catholic home was unusual for the time as it encouraged the mothers to look after their babies and to keep them if they could. It’s the last known record of Lena O’Donnell until she appears on an electoral roll in 1939 back in Cricklewood. Mary Veronica O’Donnell disappears altogether. Had Lena wanted to abandon her baby there were easier ways to do it in a big city. An article in the Daily Herald from 28 August 1937 reported 12 abandoned babies were lying in London hospitals. A search for the mothers of 15 recently abandoned children had only succeeded in two cases, it added. So how did Anthea end up on the South Downs? One theory is that Lena left Anthea with a foster mother while she went out to work. Newspaper reports from the time reveal some foster mothers offered to get children in their care adopted for a fee. They would then sell the child to a couple or another broker. An article from 1932 in the Gloucester Citizen, said the traffic in babies was “becoming one of the greater evils of London”. It’s possible an exchange of the fair-haired Anthea had been planned near Worthing, and that it somehow went wrong on the day. “I may never know what happened to me but I’ve come to terms with it,” Anthea says. At that point her father had still not been identified, but Bell had narrowed down the search to six brothers. Four of them – Michael, Martin, Patrick and Phillip Coyne – had been working as labourers in London in 1936. Martin’s daughter agreed to be tested and the results revealed she was a first cousin. This confirmed one of the other three would be Anthea’s father. Michael’s granddaughter Anne Marie was tested and the result also ruled Michael out. This left just Patrick and Phillip, but as neither had direct descendants the only thing that could prove paternity would be a sample of their DNA – hard to find years after their death. However, Anthea was also in touch with a first cousin called Dot, who was the daughter of one of Patrick and Phillip’s sisters. “I was telling Dot about the problem when she said: ‘Well I’ve still got letters that Patrick sent me,'” Anthea says. The letters, still in their original stamped envelopes, had been sent from England to the US about 30 years earlier. Bell approached David Nicholson of Living DNA. He said his company could use a recently developed forensic test to capture Patrick’s DNA from the saliva left when he licked the stamps and envelope. Last year they took a sample of Anthea’s saliva and compared it to small sections cut from the letters. The DNA in the first three samples was too degraded to use. However on the fourth, Nicholson said “we hit on more than enough DNA”. The test, which Nicholson says has “a degree of accuracy acceptable in UK courts”, proved Patrick Coyne was Anthea’s biological father. “I was so happy as I’d been looking for my father for 29 years,” Anthea says. Anthea isn’t currently in contact with her mother’s relatives, although she says her half-brother who took the DNA test “wishes me well”. However, she has enjoyed getting to know her father’s side of the family. “They told me Patrick was a very lively man, the life and soul of the party,” Anthea says. Now 80 and living near Bath, Anthea says she is grateful to both Lena and Patrick for the DNA she inherited from them, as she is pretty healthy for someone of her age. But her long journey to learn about her origins hasn’t changed how she remembers her adoptive parents. Last summer she had a family party with her children, grandchildren and cousins. Robin King, 74, has spent most of his life wondering why he was left in a box on London’s Oxford Street. Thanks to DNA, and the dogged detective work of one of his daughters, he finally has some answers.